You could put together the best home theater setup in the world, only to have a subpar AV receiver ruin the experience. If you have high-quality speakers connected to your home entertainment system, then hooking them up to a great receiver is a must. High-quality receivers would cost you more than a $100, but not outrageously over $500. Considering the long shelf life of most receivers, paying more than a couple of hundred dollars is well worth the price. 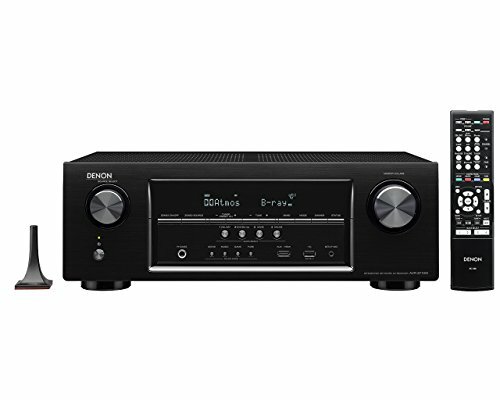 If you are on the lookout for an affordable AV receiver that is also frequently ranked on top 10 lists, then this is the one. We were recommended this product by several sources before we tried it out for ourselves. This receiver has 5.1-channel sound with 100 watts dedicated to each channel. The connectivity is even DLNA 1.5 certified, which means you can stream audio seamlessly from any device connected to your home theater setup. It has USB ports for playback and upgrades, and a CAT-5 plug is available in the back. This AV receiver has AirPlay, a feature that allows wireless streaming from iOS devices throughout the house. It’s great if you have an iPhone, but not so otherwise. The receiver is more than capable of delivering highly realistic surround sound. The surround sound mode is also automatic, so you won’t have to spend backbreaking hours setting it up. We did have some trouble with the tuner menu. We recommend this receiver mainly for the audio. This AV receiver has 7.2 channels for surround sound, with each channel supporting up to 145 watts. This is a great moderately priced receiver for 4K, 60 fps video. It supports true 4K and HDR. The receiver has an amazing four HDMI outputs and one output with HDCP 2.2 compatibility. It includes Bluetooth, NFC, USB music playback, and front surround sound tech. The receiver has an HD digital cinema mode exclusively for watching movies. It’s a pretty neat feature that allows auto audio calibration and DSD decoding (via the HDMI connections). Calibrating the speakers takes less than a minute! Despite the price tag, this receiver supports top-notch DTS-HD video and Dolby True HD audio. The menus on the receiver are really easy to use even for a novice, but the advanced features are available to those who need those. The receiver has a bunch of “mode” features in addition to cinema, including a night mode and a mode just for playing music. They enhance various features of the system, such as Night Mode which improves dialogue audio. The only downside is that the gadget can really heat up when in use for prolonged periods. This AV receiver doesn’t have that many features, but it delivers good quality sound and audio without costing a lot. The receiver has 7.2 channels but the power per channel is only 75W, which is less than the 100W standard for many receivers. It supports Ultra HD/4K video at 60Hz. Full-rate video with 4:4:4 color resolution can pass through without a problem. Interestingly enough, the gadget comes with as many as 6 HDMI input ports and full HDCP 2.2 support. It supports internet radio, and wireless streaming for both Apple AirPlay and Android Push. The device has built-in Bluetooth and Wi-Fi, plus Dolby Atmos (up to 5.1.2) and DTS:X (this requires updating the firmware though). It has a feature called IP control that converts stereo audio system to a wireless zone with an HEOS link that you have to buy separately. What we really liked about this system is how easy it is to use, even for a complete AV novice. It even supports WPA2 and not just WEP like most other wireless receivers. We did encounter an issue with Zone 2 content, audio is available, but not video. Also, the remote is flimsy and could have been built better. Keep in mind that great sound is half of what makes home theater experiences great. Therefore, when you shop for those ultra HD-supporting AV receivers, keep in mind to find a device that also supports the latest audio standards. Go for as many HDMI outputs as possible. Six are ideal and at least three are recommended. Most home entertainment devices now use HDMI connections, so the more you have, the more you can connect without a hassle. A 4K receiver is worth having only if you have a 4K supported TV at home. If you have a brand new screen, it probably supports 4K so you can benefit by paying some extra for a 4K receiver. AV receivers with HDMI 2.0a connections and HDCP 2.2 certification supports high dynamic range (HDR) and enhanced color depths. In other words, great video. AV receivers with AirPlay only work with Apple devices. But if it has Bluetooth supported, you can use wireless features with Android devices, or just about any other Bluetooth-supported gadget. In case you are wondering whether you should choose a 5.1 channel receiver or a 7.1 device, the differences between the two are not as great as you think it is. However, 5.1 channel AV receivers are known for delivering more immersive sound. But that doesn’t necessarily mean there would be quality differences between the two. That’s all you need to know about buying the best AV receivers under $500.